Open Door is our flagship magazine that bring you the latest disability news and views for disabled people across Scotland. To receive a copy of our latest magazine, please sign up to become a member of Disability Equality Scotland. You can do so today for FREE by completing our online membership form. Below is a preview of the latest edition of our magazine to give you a flavour of what to expect. To celebrate our 50th issue we have produced a bumper 50-page edition, themed on the important topics of disability hate crime and information to keep you safe. 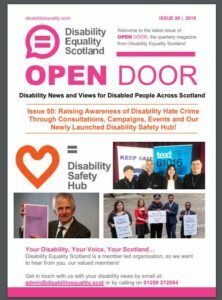 Inform: Latest news and updates from Disability Equality Scotland – Disability Safety Hub launched to tackle hate crime, Update from Emma Scott – Equality Projects Manager, Events roundup. Your Say on Disability: Consultations, surveys and weekly poll results – Changing Scottish Hate Crime Legislation, Improving Employability in the Public Sector, Transport (Scotland) Bill. Support: Services offered by Disabled People’s Organisations across Scotland – Central Scotland Regional Equality Council (CSREC), I Am Me, Scottish Ambulance Service, See Me. Access Panel Network: Latest updates from the Access Panel Network across Scotland – Update from Ian Buchanan – Access Engagement Officer, Investing In Access Update. Click on any of the Open Door issues below to download. Please contact us if you require an alternative format.